On Monday, Erin Souder of House of Earnest launched her latest and hands-down greatest endeavor -- Grandiflora. 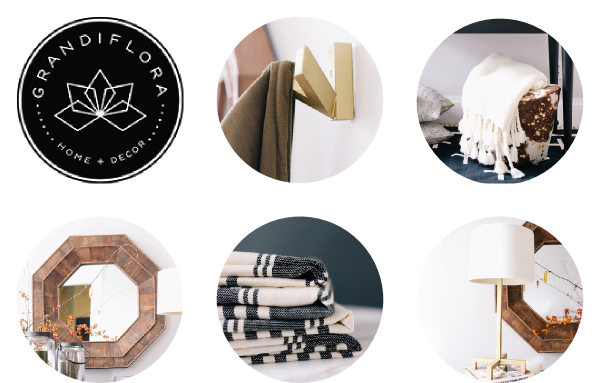 Grandiflora is a collection of beautiful items designed by Erin and her husband Matt and oh-so true to Erin's simple, glamorous-but-natural aesthetic. The great part is that there's a little something for every budget. I've rounded up a few of my favorite items from the collection above, but check it out for yourself here (and soon as I see that my absolute favorite item -- the gold hooks -- are already sold out). Also, I highly recommend a peek at the lookbook, which is full of beautifully-styled vignettes using pieces from the collection. WooHoo! Thanks for the love, friend!! Oh yea, hooks will be fully back in stock for the rest of the winter on 12/15!